I'm with Gavin, as quoted in SciAm. I think it's a pointless argument. Yes, warming was a bit slower for a few years. Unless someone can show some statistical significance of something, I don't see why it should even have a name. However, that seems to be a minority view. 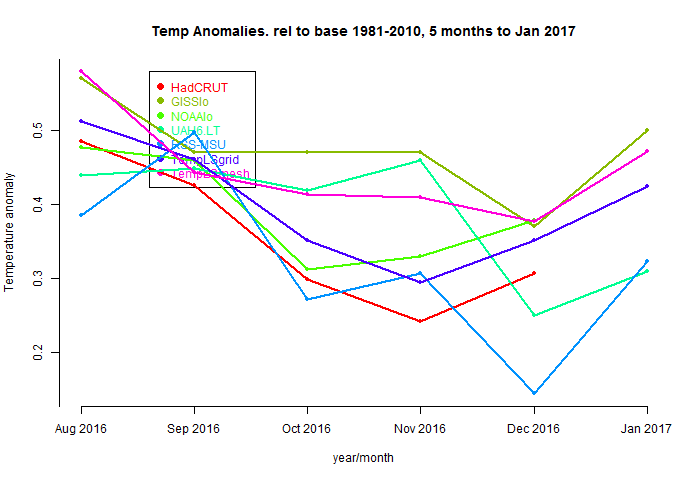 I write a lot about temperature anomaly series and their trends, and I argue a lot about Pause matters, so I should say something. What I want to do is to show how the Trend Viewer can be used to show how pauses originate, and to give an idea how unusual is the one under discussion. The NCEP/NCAR index pretty much follows GISS, upward. The satellite indices rise in unison. NOAA follows TempLS mesh down, with TempLS grid dropping further. Normally I would expect TempLS mesh to go with GISS, and grid with NOAA. The difference is there, but with TempLS generally dropping more. I'm not sure why. We have very little information yet about 2016, but we do have a possible pattern in the 1997/8 El Nino. I started thinking about this post when I noted that surface measures either diminished or advanced by a little from December to January. I thought that might be a deviation from the 1997/8 pattern, but I found that it was similar then. Satellite data rose by quite a lot, but less than in 1997/8, though it started from a warmer base. I showed a plot of RSS in that time here. So in this post, I'll develop those plots for a range of indices, showing more detail of the current evolution. I'm thinking also about the prospects for 2016 being a record year. I think it is quite likely, though satellite measures are less well placed, and more volatile. So there is an interactive plot below the jump. I'll also take the opportunity to digress on some updates to the data pages. The two active plots that show monthly data are here and the trend viewer. I have rearranged the display for better ordering of datasets, and to make it easier to make additions. I have added, or restored, UAH V5.6, UAH V6 TMT, and a newish TMT measure from NESDIS, NOAA. I think there will be a general shift to the Mid-Troposphere level, partly because of declining infrastructure to support TLT. For the active plotter, I have changed so that if you ask for data in trendback more, it shows the trends as plotted, not the time series. I have added an axis on the diagonal of the trend viewer. This is to help identify the various events (mainly ENSO) that it shows. 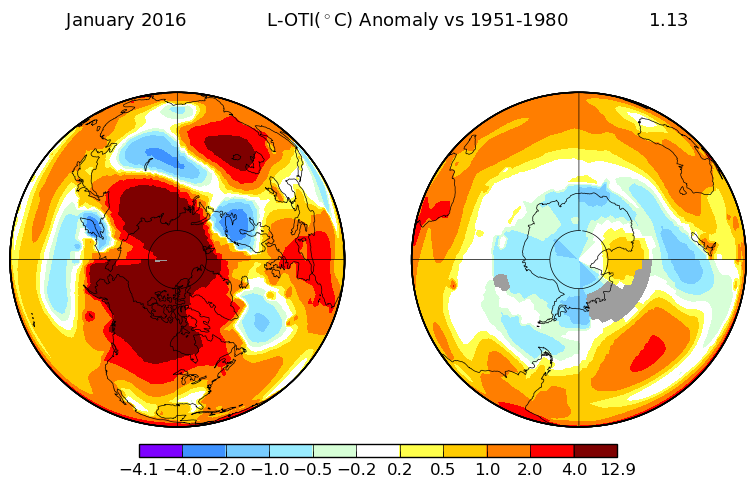 For GISS this month, I'll show their polar projection, because as Olof suggests, I think this is the key to the variability. There are three main features. A big very warm region around the Arctic, but a large cool region around the Antarctic. In the context of present warmth, that cool Antarctic is cold indeed, and probably does more to bring down the temperature than the more intense cold in a band from Europe to China. So the end result depends on how the various indices add up these competing effects, two in regions lacking good coverage. GISS interpolates to give good weighting to the poles, and this boosts the Arctic effect. Normally I would expect TempLS mesh to match that, but apparently this time, it didn't quite. Or maybe it gave more weight to the Antarctic. TempLS grid definitely underweights the poles, and so the Europe cold effect dominates. On this basis, I think it is likely that NOAA and HADCRUT will show a reduction for January. To remark on where this stands with El Nino - on past experience the next four months or so are likely to be the peak. So the January rise is rather small. On the other hand, December (and October) had risen quite a lot, so it may just be a broadening of he peak. Below the fold, I'll show the usual comparison between the GISS flat map and TempLS grid. The GHCN data for January is now fairly complete. The TempLS report is here. Unusually, the holdup this time was US data, which is usually first to appear. The headline result is that TempLS mesh is down from 0.97°C (1961-90 base) in December to 0.899°C in January, almost the same as November. TempLS grid showed a greater drop of 0.18°C. The lead up indicators were mixed. The satellite measures rose quite strongly. The satellite measures rose quite strongly. The Moyhu NCEP/NCAR index showed a small rise of about 0.04°C, as I believe did Weatherbell. But Karsten, based on GFS, had a very large drop of 0.25°C, and for NCEP/NCAR 0.15°C. There is support for a significant drop. I would expect falls in GISS and NOAA, though possibly not quite as large. The daily NCEP/NCAR helps understand what happened. The first half of Jan was very warm, and then a sudden cooling. Back to very warm in February. It seems qite likely that different measures might get variable results there. 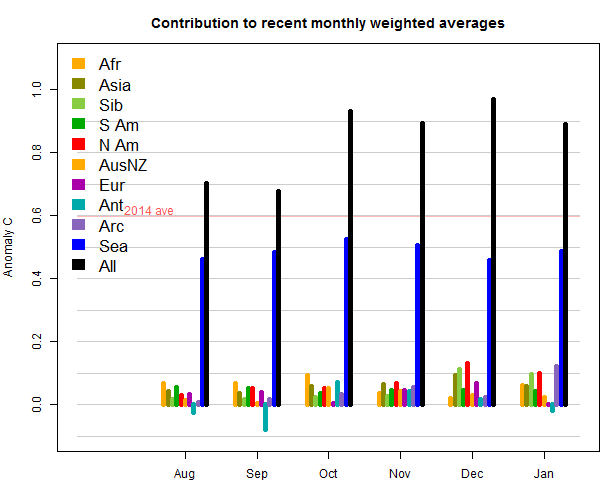 It shows the actual area-weighted contributions of each region to the monthly anomaly. Interestingly, SST rose, after a dip in December. But Europe, Australia and Antarctica were well down relative to earlier months, and other regions somewhat more subdued, except Arctic, which was warmer. The Spherical Harmonics map and the stations reporting are in the report. Notable features are a warm Canada and a fairly narrow band of cold stretching from Scandinavia to China, with hot spots either side. Also, of course, El Nino. The satellite temperatures for January are out now, and also the Mohyu NCEP/NCAR index. All increased, quite significantly. UAH Ver 6 beta was up by 0.09°C, to 0.54°C. RSS-MSU was up from 0.543 to 0.663°C. In both indices, Jan 2016 was the highest ever, making four such months in a row. However, the jump from Dec to Jan was rather smaller than in 1997/8. I have an eye here on the implications for the RSS "pause". February will have to be a lot warmer (0.88) to erase the pause in that month. OTOH, the January warmth, if sustained, will ensure there are only positive trends after March data. The NCEP/NCAR index rose from 0.621 to 0.665°C. Again, very warm, but not as big a rise as might have been expected. In fact, the first half of January was very warm indeed, but then came a relatively cool period. February is starting warm again. Any news on the GWPF International Temperature Data Review? I mentioned the revised state of this project in September. The project was announced in April. The news page hasn't updated since September. And the submissions seem to remain unpublished. I'll check back around the anniversary of the announcement in April.